If you are a crafter you know how frustrating it can be to have an unorganized crating space. Like those times when you are trying to hold two tiny little things together… and rrreeeaaaccchhh across the table for your glue gun. Or how about always searching for the scissors… that seem to grow legs and hide under everything. What if you had something that would just keep everything you need right at your fingertips? That is the thought behind this awesome new product – the Hobby Holster. 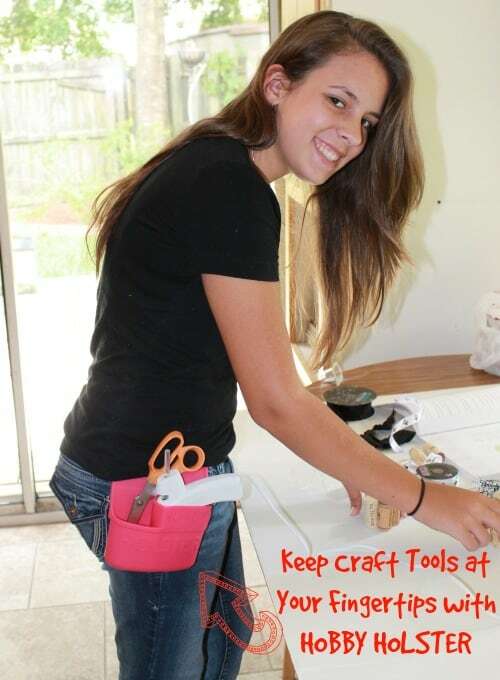 The Hobby Holster® is a heat resistant, 100% silicone pocket that is designed to hold hot crafting tools. A divided pocket separates a glue gun from hot glue sticks, glitter pens from scrapbook paper, mod podge from felt and endless other odd couples and crafty pairings. 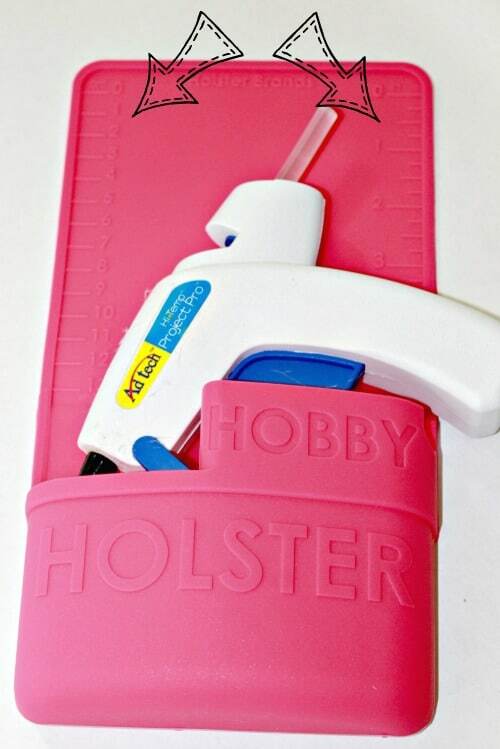 The silicone material allows the Hobby Holster to cling to any smooth surface without the use of suction cups or adhesive, it’s easy to place and easy to move when your crafting day is complete. It also sticks to itself – so The Teen wore it a la tool belt style and it was perfect. I received a Hobby Holster to review and I can tell you – it came in quite handy when we were putting together the Wine Cork Photo Holders last week. Between gluing the corks and snipping the ribbon – the Hobby Holster kept everything we needed right on our hip. To be 100% honest – I didnt even consider putting it on the table – I just strapped it right on our belt. Easy peasy. I also loved that there was a ruler right on the Hobby Holster too. At one point I was able to lay it out and have The Teen cut ribbon for me while I worked on gluing corks. There are inches on one side and centimeters on the other. The Hobby Holster is just $19.99 but MoscatoMom Readers can get 25% off using the promo code Moscato25 between now and July 31st! Head over to HobbyHolster.com to order now!